Notes: The special formula makes it fast and easy to use product, gives shine to the skin, brighten their color and can take care of footwear thanks to the waxes contained in it. This product is also available in dark brown, black and neutral. Different skin from the color shown, suede, nubuck, velvet, alcantara, peccary, patent leather, soft leather, delicate skins, leather, matte leather and oiled leather. Based solution of waxy mixture (water and waxes for the protection of the skin) and resin base (water and resins for the shine); the product spreads on the shoe leather wiping a film that is polished car. 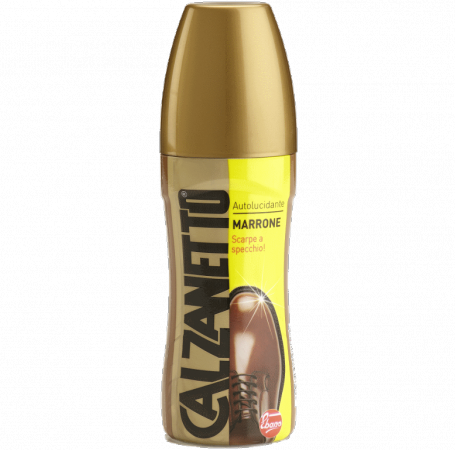 This type of product (whatever their trademark), does not penetrate the skin but is deposited on the surface, so it is necessary to treat the shoes with a damp cloth every 5/6 coats of polish liquid car.